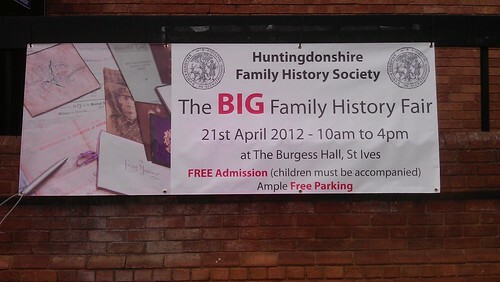 The BIG Family History Fair 2012 – the Huntingdonshire Family History Society event took place this weekend. 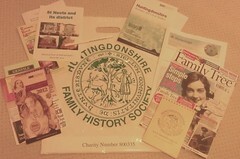 This weekend I went along to the BIG Family History Fair 2012 at St. Ives, Cambridgeshire (alright, Huntingdonshire). The demand for that ample free parking was a little underestimated. The event, which was organised by the Huntingdonshire Family History Society took place at The Burgess Hall and soon packed out their car-park. Fortunately for me, my gym is right next door, so I arrived early for a workout before heading nextdoor for some serious browsing amongst the crowds. For those of you not in ‘the know’, Huntingdonshire stood as an administrative county until 1974, when it was absorbed by its neighbour and became a district of Cambridgeshire. The up-shot of this is that researching the records means you need to remember that pre-1974 the county is Huntingdonshire, and its records are held in Huntingdon. 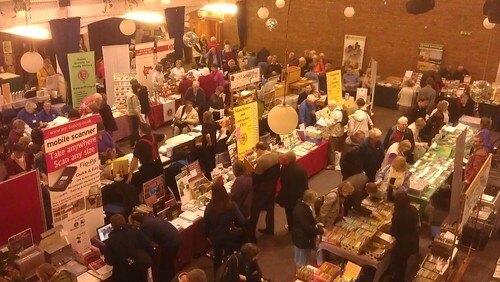 The event took place across two floors – two halls brimming with stands from those now familiar companies and societies like S&N Genealogy, the Cambridgeshire Family History Society, the Fenland Family History Society, and My History. Upstairs were a series of talks organised by the hosts. Just a few of the stalls – a mixture of societies and commercial companies. I went along to Maureen Nicholls‘ free ‘Illustrating Your Family History’ talk – a captivating and fun 40 minute talk on ways to bring interest to those data heavy trees, charts and documents that the genealogist spends their time producing. Some great ideas came to light – including the reminder that when you’re lost for a photo of YOUR ancestor doing something – show a representative image of the types of schools, costumes, work that ancestors lived through – instead of admitting defeat because you don’t have a photograph of THEM in that scenario. Maureen’s delivery was as engaging as her ideas, and she offered an occasional glimpse of her own research – an aunt who died on-board the doomed SS Princess Alice, her family tree cross-stitch that went to the House Of Lords, and her penchant for jellied eels (yuck!). I bought the Potton parish church registers on CD-rom. I’d already decided what my purchase of the day was going to be, and so having achieved the largest ‘tweet-up’ that Huntingdonshire has probably ever known by meeting up with fellow twitterer Jane ‘@RamblingGenes‘ Freeman – who proudly showed me her new Flip-Pal Scanner (see, told you I wouldn’t tell anyone you bought one), I moved over to my target – the Bedfordshire Family History Society stand which was busy but very helpful and where I managed to purchase the Potton parish registers on CD-rom. I was really pleased to see the range of companies and societies represented here – it was always going to feel different from a Who Do You Think You Are? Live, but it seemed to be well organised and attended. I did feel the venue was a bit hot and stuffy, and the bar-staff seemed a little surprised that people wanted drinks and food at the drink and food bar – definitely not the organisers fault here though. The added bonus for me was that it was very local, and of course FREE to attend! I look forward to next year’s show – hopefully it will one day be on for a whole weekend, or on for longer than 10am-4pm with lots more useful genealogy talks. Surname Saturday – the Franks family from Cambridgeshire and Huntingdonshire. The surname of Franks is part of my paternal family and my last direct ancestor to bear the name was Sarah Jane Franks, who was born in 1803. 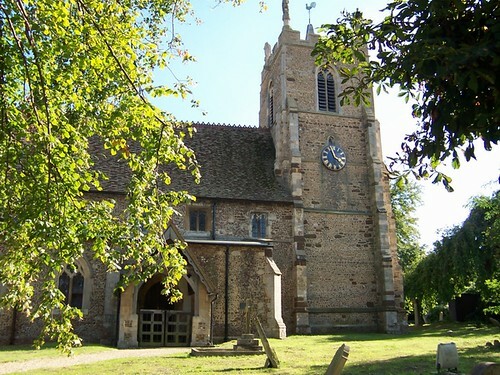 Sarah Jane married my Great x 4 Grandfather Daniel Watson Giddings during 1825 at a church in March, Cambridgeshire. 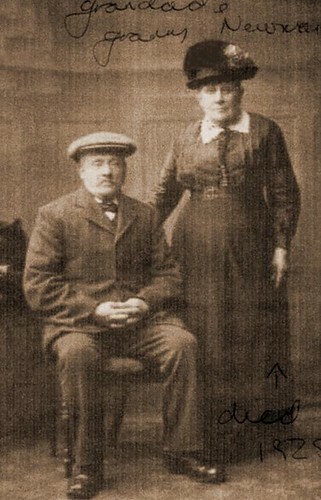 The couple settled down to produce eight children, which included a short-lived set of twins born in 1841. 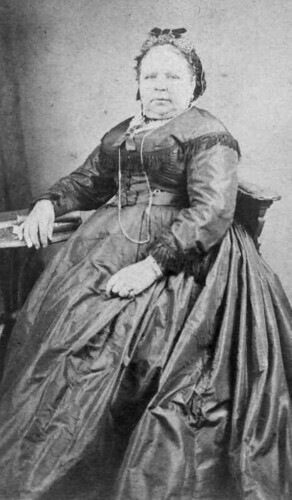 Sarah’s sister, Mary Ann Franks (born in 1800) married Daniel’s brother James, but she died in 1824. James remarried, but then died in 1840. Sarah’s origins are a little ambiguous – looking back to the 1871 Census for March, Cambridgeshire, she states that she was born in that parish. However, go back 10 years to 1861, and Sarah states that she was born in “Coppenforth, Norfolk”, which does not appear to exist. However, just a few miles from March is a parish called Coppingford – so this is likely to have been (or where she thought) her place of birth. 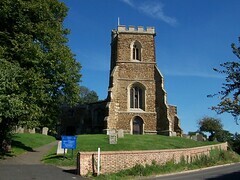 Coppingford’s parish church was destroyed prior to 1707, after which the villagers used the nearby church at Upton. It is likely that church records from Coppingford prior to this date were also destroyed. By the time of Sarah’s birth, the population of Coppingford was just 53 persons. By 1931, this had dwindled to 29 persons. Without church records or gravestone clues, the real identity of the origins of this surname are clouded, unless records for Upton can open a window on Sarah’s family.